Singapore, April 6, 2016 – Six weeks before CES Asia™ returns to Shanghai, more than 17,000 high-level industry professionals from more than 70 countries have already registered to attend. Registration numbers are up 40 percent over the same period in 2015, the event’s inaugural year. Owned and produced by the Consumer Technology Association (CTA)™ and co-produced by Intex Shanghai, CES Asia™ 2016 will run May 11- 13 in Shanghai, China. CES Asia 2016 will showcase innovation across 15 product categories focused on the themes of the Internet of Things (IoT), innovation and connectivity. The showfloor will house the latest in 3D printing, vehicle technologies, lifestyle, video gaming and more. To register for CES Asia 2016, please visit CESAsia.com. An RMB 50 registration fee goes into effect on April 1 and increases to RMB 100 on-site. Registration is always free for credentialed media. Note to Editors: Journalists traveling from outside of China will require a J-1 or J-2 visa. 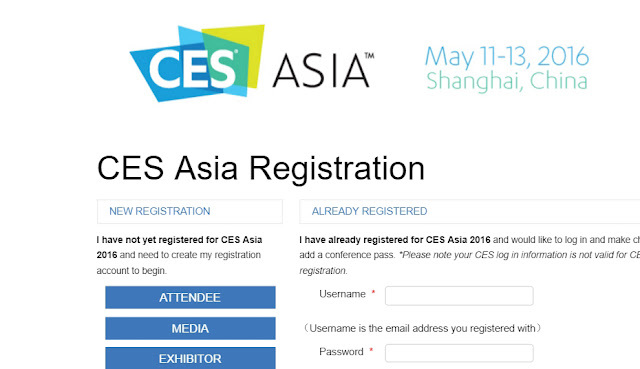 For questions about exhibiting at CES Asia, contact Brian Moon at mailto:bmoon@CE.org or +1 703-907-4351.